While we're still trying to figure out the season, Grant has his picks for the highs and lows from Glendale. Adam got the train back on the tracks in Glendale after having quite the wild Main Event last week. No major mistakes, no crashes, no moments of looking like he's about to die, just a good start and consistent laps all the way to the finish. The more calculated Adam that showed up in Glendale is the one that he has been talking about. 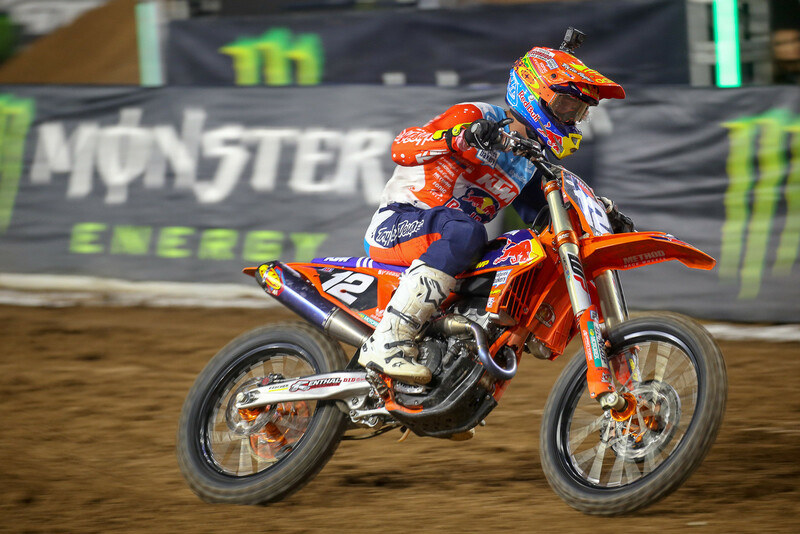 He wanted to be less of a rider that goes fast and crashes fairly often this year, and more of a stronger, more consistent rider that can actually fight for the title. We didn't see that at Anaheim 1, but we did at Glendale and I think he's pretty excited that he was able to show that all of his efforts in the offseason weren't for naught. He now sits at a very manageable championship deficit of five points to Colt Nichols. It's on, folks. This is Chris Blose's 14th year of racing dirt bikes professionally. That's a long career, period. A lot of factory level guys don't find themselves in the sport that long, but Chris just keeps racing and doing well. 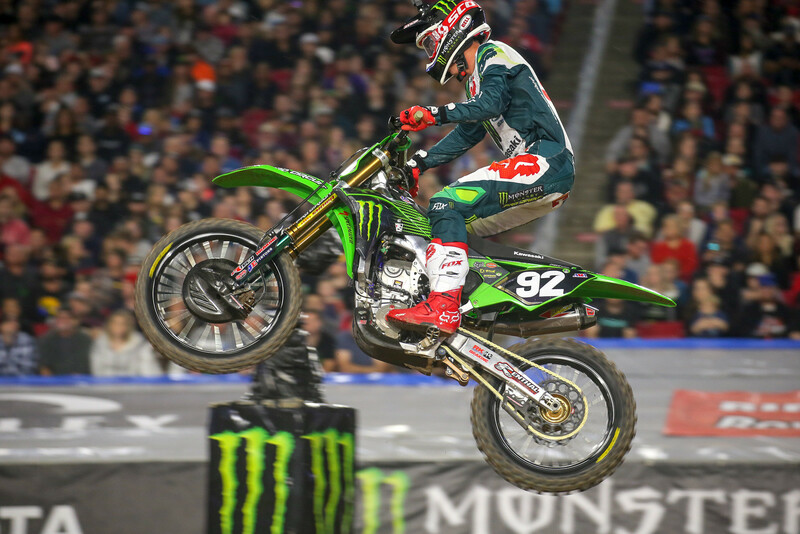 He had spent the past few years racing the AMSOIL Arenacross series and contending for titles, but after it was announced that the series was shutting down last year he had to find a ride for Supercross. He was able to do that with the Gas Monkey Energy / AJE Motorsports Husqvarna crew, and clearly he still has some unfinished business to attend to. He was the only non-factory rider in the top ten in the Main Event, and he beat several factory riders as well. Now, I don't necessarily think that scoring top ten finishes will secure him a factory ride at his age, but it is great exposure for his team and very impressive to see. He'll be one to watch as the championship carries on. Shane has looked fine through these first two rounds, but I don't think I'm alone in expecting more from him. He was my pre-season pick for the title, and I expected for him to come out and make a statement like he has the past two years. It didn't happen last week, and he didn't look to have the speed to contend for the win this week, either. He has just looked...okay. Maybe I was underestimating the rest of the competition he has this year, but there's still plenty of racing left, so we'll see how he does over the next few rounds. No, a sixth-place finish isn't horrible. Nonetheless, Dylan has shown that he definitely has the speed to win races and be in the title chase, but a bad start last week and a crash early in the race this week have tripped him up. Luckily for him, he is still only nine points out of the championship lead with several rounds left in the series, so if he can just put together a few consistent races he could find himself right in the thick of it again. It's really as simple as that, as speed isn't the issue here. We're only two rounds into the season but it has been about as weird as it could be. Justin Barcia winning last week was a surprise, but not entirely out of the question. 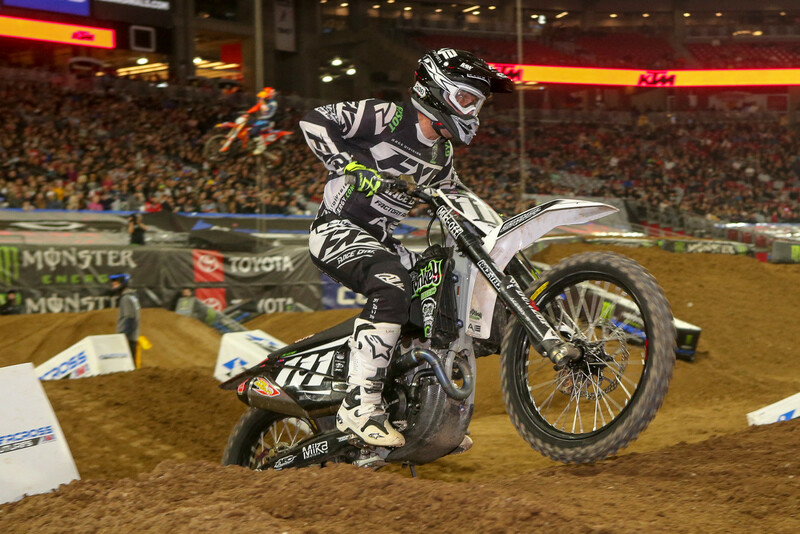 However, Blake Baggett winning this past weekend, and in impressive fashion, threw me for a loop. Sure, Blake has shown over the past two years that he has had the speed to win, but he has struggled to put it together during the Main Events. He has been able to podium, and he has had some impressive charges through the field, yet a win just hasn't been in the cards for him...until now. He didn't just luck into the win, either, as he made a pass on the defending champion to take the lead, and he was gone within about half of a lap. This was a statement ride, and further proves how wide open this year's championship is. The two big name guys that had a rough race last week bounced back this week, while Ken Roczen has remained consistent and thus is now in possession of the red plate. This could get good. The real Jason Anderson showed up to race in Glendale. It seemed like the nightmarish day he had at the first round was largely brought on by everything going on for him: running the red number one plate, having to do the championship ring ceremony, and several other obligations. He said in the press conference that he just wasn't in the right headspace to race last week, and it definitely showed. He was able to bounce back this week, and at one point I thought he was about to ride off into the sunset and take his first win of the season, but then Blake Baggett decided it was his time to shine. Even without the win, though, this was exactly what Jason needed. He clawed back some valuable points and proved to himself that he should be running up front like he did all of last year. It was a huge step in the right direction, and something that should be easy for him to build off of. On another note, it was a bit interesting to see him actually apologize for taking down Ken Roczen for the lead after the restart. There was a point in Jason's career where I don't think he would have even thought about apologizing, but he seemed genuinely upset with himself over the move and owned up to it. Personally, I didn't think it even needed to be addressed by Jason. He needed to make a move on Ken, and a block pass ended with Ken picking his bike back up. It happens, but props to Jason for making it known that he doesn't want to be known as the guy that races like that. This wasn't really a "bad" race for Eli, but it wasn't what everyone expected, either. The bigger track layout and longer rhythm sections have generally favored Eli in the past, so it seemed like he was a fairly heavy pre-race favorite for the win. He looked quick in qualifying, too, but then later on in the night he found himself in the LCQ after starting his heat race in dead last because he thought something was stuck in the rear of his bike. This led to him getting a mediocre start in the Main Event and he never really started to lay down the kinds of laps that we have come to expect from Eli. He did move up through the field, and the restart definitely helped him, but he never looked to have the speed necessary to win. Steve Matthes said that his rear tire looked to be destroyed after the race, so that might have had something to do with it. Regardless, he's light years ahead of where he was this time last year. To be only four points out of the championship lead two rounds in, instead of 48 points like a year ago, is a much better situation to be in. It's only a matter of time until he grabs his first win of the season. 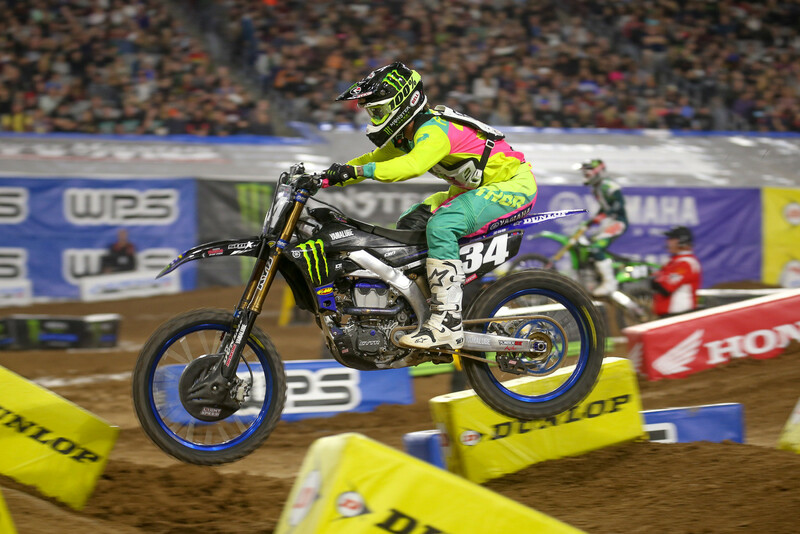 Justin Hill started in last place in the Main Event after an off-track excursion and crash on the concrete stadium floor, so coming back to 13th in this field isn't horrible by any means, but these first two rounds have not gone so great for the 450 rookie. He straight up didn't ride well in the wet conditions last week and finished 15th. Justin was a huge question mark coming into the season. He has shown before that he has the skills on a 450 to run up front, and he further proved that he has the speed in Glendale by qualifying in first place, but it's impossible to figure out which Justin will show up for the race. If he gets a decent start, he tends to move his way towards the front. If he gets a bad start, he may not move forward as quickly as you'd probably expect. This formula works fine if all he wants to do is get the occasional podium and contend for wins every once and a while, but if he wants to win championships at the 450 level he is going to have to figure out how to move through the pack more efficiently. Malcolm looked absolutely fantastic in these first two rounds. His fitness was finally at a level to match his speed, and he seemed more calculated for the most part. But, one mistake in the whoop section during the Main Event led to him breaking his femur, and that's basically it for him for the season. This is a major, major bummer. It was looking like this could be the year that Malcolm proves that he is taking his riding and training seriously, and that he deserves a factory ride (although the support that MCR Honda receives is nothing to scoff at). It looks like we'll have to wait until next year to see him again, though, as I doubt he'll come back from a broken femur by the end of the season, and I'd bet that he won't race the full national series, if at all. Heal up, Malcolm, we can't wait to see you back on the track. Anderson has a really smart way of passing other riders. He puts them on the ground; this lets him look forward to the next rider and not worry about getting re-passed any time soon from the guy he just passed and sent to the ground. And it’s all ok. I made expert 30 years ago, and have raced vet class now for a long time. If someone cut across 3 ruts to do an “Anderson” on me there would be a fight after that Moto. If you are faster, find a way by. I think JA21 could do just fine without that kind of dirty riding. He is good enough to win clean. I know lots of people think that sort of pass is cool, but when it’s done to you you won’t like it. Still really bummed about Malcolm, although not the fastest guy every weekend I always loved watching the dude ride.